When Kerry Greene won her fifth Jeopardy! match last night, it was the third consecutive game in which she’d won from behind. I thought that feat was relatively rare – maybe once or twice a season, tops. Turns out I was overestimating. According to J! 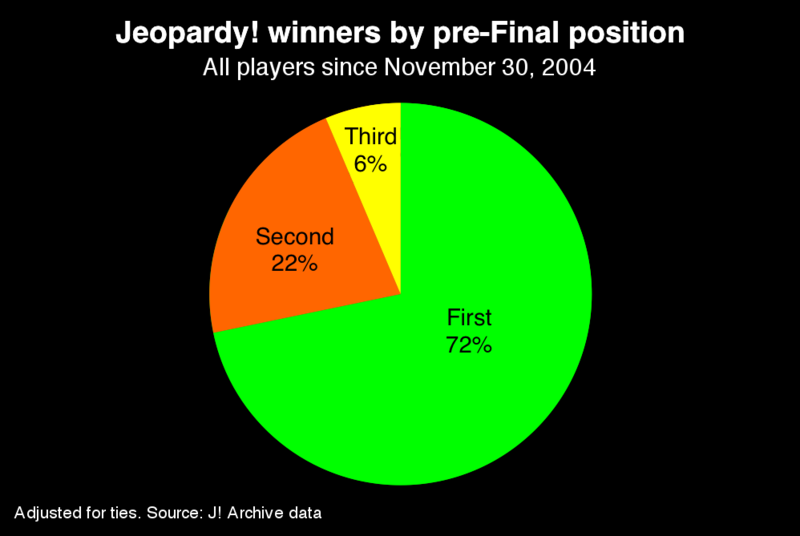 Archive data, Kerry is just the fourth player in Jeopardy! history* to win three straight games when trailing before Final – and the first five-timer to do so. Why is this so rare? Let’s start with some basic statistics. 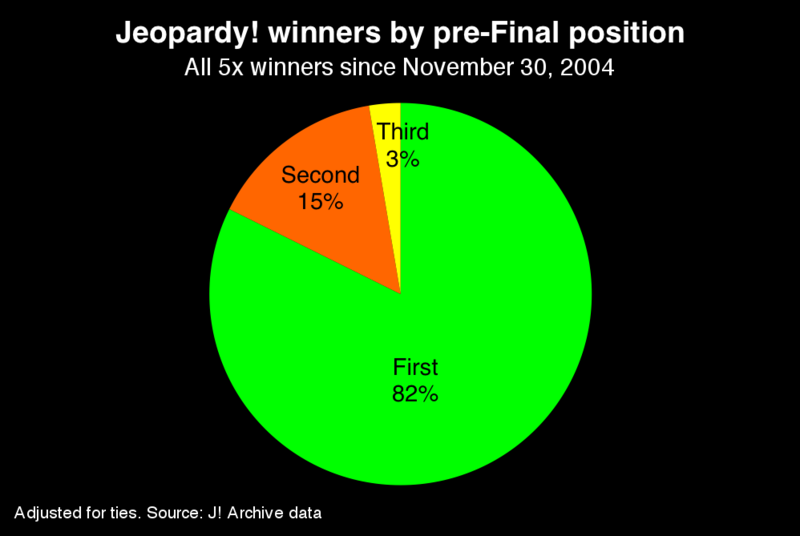 This one is simple: if possible, you want to be in the lead heading into Final Jeopardy!. It should come as no surprise that the player in the lead heading into Final wins most frequently: about 71.7% of the time since Ken Jennings lost. Here’s that same chart showing only players who have won 5 or more games. Be in first heading into Final, and you’re much more likely to win. In any position, it also helps to get Final correct, as Kerry has done all five times. Another way to demonstrate the statistical improbability of what Kerry has done is by simulating the Final Jeopardy! outcomes of these three games. Game 3: Kerry, in second, could win only if she got it right and Tom got it wrong. Game 4: Kerry, in third, could win only if she were the only player to respond correctly. Game 5: Kerry, in second, could win only if she got it right and Evan missed. As I mentioned, Kerry is not alone in winning three in a row from behind. 4xer and eventual TOCer Carolyn White won her first three games in this fashion in 1998. More recently, two 3xers have pulled off the feat: Kristina Caffrey (2008) and Jessamine Price (2012). Nor is Kerry the first 5xer to come from behind thrice overall. J.J. Todor, Paul Nelson, and Joel Pool all faced deficits three times in their first five games, with Joel even winning his sixth game from second. But to make a longer run, a player needs to be in first more consistently. Ken Jennings never trailed in regular play. Neither did Julia Collins or Arthur Chu – until the games they lost. Of all champions with 7 wins or more, only 19-game-winner David Madden won from behind three times. *EDIT: As expected, the fine historians over at JBoard knew of some examples not in the J! Archive. Sara Cox‘s first three games were come-from-behind victories, but as the first two were ties that wouldn’t happen in today’s environment (the leader withheld the dollar), I’m loathe to add it. Frank Epstein‘s five wins featured three second-place Finals. Jeopardy! is a tough game to win – and it’s even tougher to win when you’re trailing. Joel Poole won all 6 of his games without a lock and Drew Horwood 8 of 9. Both probably ran on the high end of variance of getting FJ correct. Joel seems to hold the record for most come from behind wins with 4? That’s right – looks like Joel is the only one to hit that number. And Drew didn’t have his lock until his 8th game, which is incredible. The 1990 player is Sara Cox, not Sara Pool. Whoops! Wonder how I made that mistake… thanks, Mark. Looks like Andrew Haringer joins the list of players to come from behind three games in a row, and the first male ever to do so! Brad Plovan also apparently had three wins from behind (not necessarily in a row though).